UNITED STATES: The government's Energy Information Administration (EIA) said around 49% of new utility-scale electricity generation added in 2017 came from renewables. 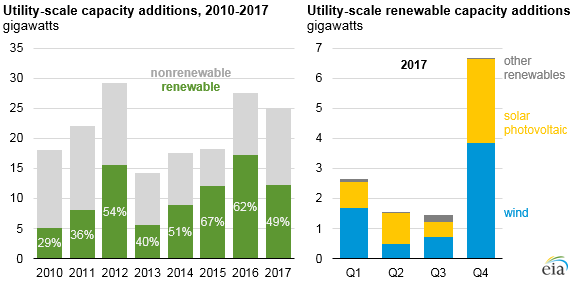 According to EIA figures, based on planned additions in Q4, which are subject to change, around 25GW of new utility-scale generating capacity was added in 2017. Of the roughly 12.5GW of new renewable generation added last year, more than 6.5GW is expected to have been added in the fourth quarter. "Renewable capacity additions are often highest in the final months of the year, in part because of timing qualifications for federal, state or local tax incentives," the EIA stated. Renewable generation additions were dominated by wind and solar. A further 3.5GW of small-scale solar capacity is thought to have been installed last year. 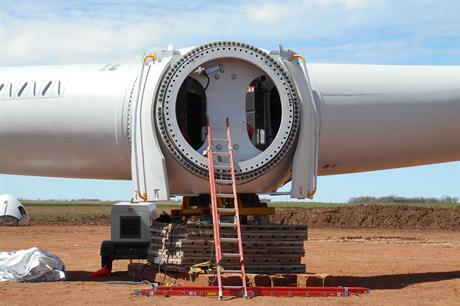 A little over 6GW of wind is expected to have been added, according to the EIA figures.